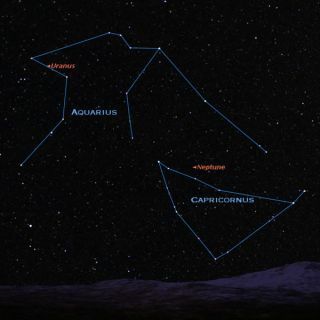 Look to the south-southwest on November evenings to see Aquarius and Capricornus, and try your eye at finding our solar system's two most remote gas giants. Most people have seen the five brightest naked-eye planets,yet there is a sixth planet that can be spied without optical aid and another whichcan be picked up using just a good pair of binoculars. You'll have to know exactly where to look for them, though. Fortunately, both are currently well placed for viewing inour evening sky and with the bright moon out of the way this week, it will be agood time to search for them. Barely visible to the unaided eye on very dark, clearnights, the planet Uranus is nowvisible during the evening hours among the stars of Aquarius, the WaterCarrier. It is best to study a sky map first, and then scan that region withbinoculars. Using a magnification of 150-power with a telescope of at leastthree-inch aperture, you should be able to resolve it into a tiny, pale-greenfeatureless disk. Uranus, which lies at a mean distance of 1.8 billion miles(2.9 million kilometers) from the sun, has a diameter of about 31,800 miles(51,100 kilometers). At last count, Uranus has 27 moons, all in orbits lying inthe planet's equator in which there is also a complex of nine narrow, nearlyopaque rings, which were discovered in 1978. Uranus has a rocky core,surrounded by a liquid mantle of water, methane, and ammonia, encased in anatmosphere of hydrogen and helium. A bizarre feature of the planet is how far Uranus is tipped. Itsnorth pole lies 98 degrees from a perpendicular to its orbit plane.Thus, its seasons are extreme: when the sun rises at its north pole, it staysup for 42 Earth-years; then it sets and the north pole is in darkness for 42Earth-years. Sir WilliamHerschel discovered Uranus on March 13, 1781, noting that it was movingslowly through the constellation Gemini. Initially, however, Herschel thoughthe had discovered a new comet. Neptune, on the other hand, is much too faint to be viewedwith the unaided eye, lying at a mean distance from the sun of 2.8 billionmiles (4.5 billion kilometers). It is slightly smaller than Uranus, with adiameter of 30,800 miles (49,600 kilometers). Neptune is about seven times dimmer than Uranus, but if youhave access to a dark, clear sky and carefully examine our map, you should haveno trouble in finding it with a good pair of binoculars. Neptune can be foundamong the stars of Capricornus, the Sea Goat. With a telescope, trying toresolve Neptune into a disk will be more difficult than it is with Uranus.You're going to need at least a four-inch telescope with a magnification of noless than 200-power, just to turn Neptune into a tiny blue dot of light. Voyager 2passed Neptune in 1989 and showed it to possess a deep-blue atmosphere, withrapidly moving wisps of white clouds as well as a Great Dark Spot, rathersimilar in nature to Jupiter's famous Great Red Spot. Voyager 2 also revealed the existence of at least threerings around Neptune, composed of very fine particles. Neptune has 13 moons, one of which, Triton, has a tenuousatmosphere of nitrogen and at nearly 1,700 miles (2,700 kilometers) indiameter, is larger than Pluto. Neptune's discovery came about from long-term observations ofUranus. It seemed to astronomers that some unknown body was somehow perturbingUranus' orbit. In 1846, two astronomers, Urbain J.J. Leverrier (1811-1877)of France and John Couch Adams (1819-1892) of England, were independently working on this problem. Neither knew what the other was doing, but ultimately,both men had figured out the probable path of the supposed object that wasdisturbing the orbit of Uranus. Both believed that the unseen body was then inthe constellation of Aquarius. Adams was a student at Cambridge University, England, and he sent his results to Sir George Airy (1801-1892), the Astronomer Royal, with specificinstructions of where to look for it. For some unknown reason Airy delayed a year before startingthe search. In the meantime, Leverrier wrote to the Berlin Observatoryrequesting that they search in the place his observations directed. Johann Galle andHeinrich d'Arrest at Berlin did exactly as instructed, and found the new planetin less than an hour.